Brian describes how the media and politicians are trying to hide and ignore a new study that shows a pause in global warming. This study has some of the biggest names in the global warming industry signing on to it so why are we not hearing about it. So they all went to Davos, on our dime, and discussed global warming, while Fukishima continues to kill the Pacific Ocean, and a huge ongoing radioactive methane leak is escaping from the area near Los Angeles, oh and lead in the water in Michigan. Fukishima could very well become an extinction level event, but they never discussed it in Davos. That tells one what a crock this carbon tax is. Many people who realize the whole AGW scam – the term ‘hoax’ lacks seriousness – is in fact a scam, often ask HOW is this accomplished. The following link to Lord Monckton’s speech: “Our Last Year of Freedom? – Christopher Monckton’s Warning” answers that question – among others. NB – This speech is pre-Paris COP21 and pre removal of Tony Abbott. When petitions come on here ,I don’t bother to read I just hit the button,I just know it’ll. Piss off jimmy saliva. 1. "In summary, climate models did not…produce the observed temperature trend over the early twenty-first century in spite of increased anthropogenic forcing. Translation: temperature did not rise, while CO2 did —i.e. there is no correlation between CO2 and temperature for this time series. Um…yup. Or at least when it comes to CO2. if the climate did not change on a global scale, we would be dinosaur food. Oats . . .. you have to be a Special Kind of clueless to believe that .04% of the Atmosphere controls the Klimate. AGW is still an Unproven Hypothesis and all the Computer Models . . . were Wrong ! It’s the SUN . . .
We have a “family friend” who is immersed in the climate change choas, runs protests and pickets and everything. Then flies off to Cuba 3-4 times a year with the whole family (sometimes on different flights), drives to the gym and back, drives to cello practice and back, drives to work and back, husband drives all over (even has a new fancy car) has a pool, smokes! if that adds anything to the quality of air…..just a bunch of BS climate change enthusiasts making us pay. And of course they voted Liberal. Typical left wing B.S. The enlightened really hate it when the truth gets in the way. Some people you really have to spoon feed. Which study? It would be a more credible statement if you would at least say which study you’re talking about. Little Sammie, poor little Sammie, TheRebel asking for people to sign their petitions is bugging him. Thank you, TheRebel, for all your petitions, for doing something, instead of just sitting like a lump of schist and complaining all the time … you know, like little Sammie Young does. Will you sign my petition? Go to petition pause dot CA, to make your voice heard. Hard not to notice the liars have moved the times of their doomsday predictions to many decades hence, since there short term ones have been shown to be complete bunk. Something the MSM wouldn’t report on. Again. The High Church of Man Made Global Warming will receive it’s tithe so it can get more Cool-Aid for the devout. You have good links and as you stated, they give the best information available. I would add, There has been no significant increase in global temperatures for twenty years. In fact during the winter 2014/2015, global temperatures started a slight downward track, the Artic had the largest ice build up for years. Bet it will not stop the Carbon Tax. Warren Buffet was on CNBC this morning. Joe Kernan, CNBC’s resident right wing pest, questioned him on the risks posed to his interests in Geico by storms driven by climate change. Warren Buffet indicated those risks were not that significant. The greatest investor in the world and noted Obama supporter is not the least bit concerned. You think somebody in the insurance business would know wouldn’t you? The scientific method is very clear in regards to the testing of a hypothesis. Professor Richard Feynman, Nobel Laureate in Physics said, “It does not matter who you are, or how smart you are, or what title you have, or how many of you there are, and certainly not how many papers your side has published, if your prediction is wrong then your hypothesis is wrong. Period.” Here you can compare the IPCC’s invalidated models with reality. “This beautiful graph was posted at Roy Spencer’s and WattsUp, and no skeptic should miss it. I’m not sure if everyone appreciates just how piquant, complete and utter the failure is here. There are no excuses left. 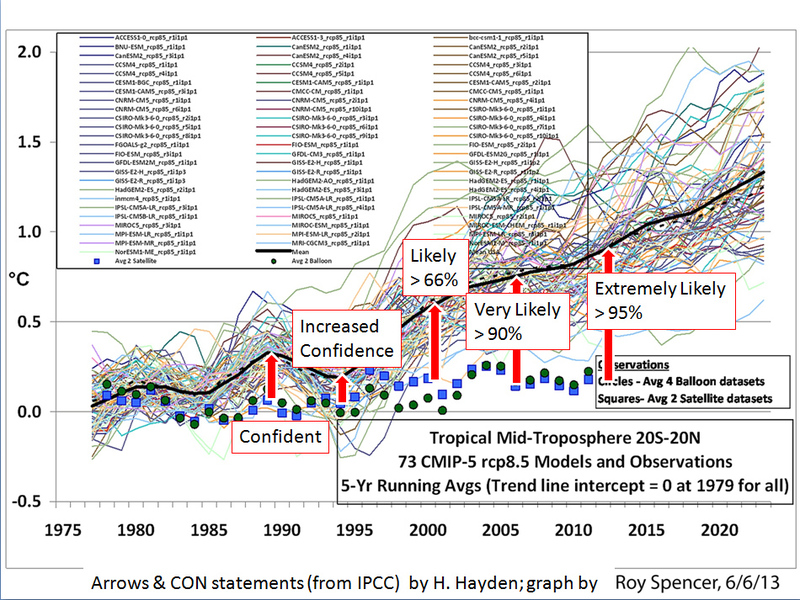 This is as good as it gets for climate modelers in 2013. John Christy used the best and latest models, he used all the models available, he has graphed the period of the fastest warming and during the times humans have emitted the most CO2. This is also the best data we have. If ever any model was to show the smallest skill, this would be it. None do." CAGW is a failed hypothesis. Hey Brian , So… yah… global warming hoax. The truth..once again delivered by THE REBEL.. I allways like to tell people that there,s way more info that it,s a hoax! ……..Like waaaayy more!!!! Looks like George Carlin nailed it 25 years ago…ya 25 ..look it up on you tube…George Carlin global warming. And this guy is no scientist. Just a logical thinker…something Liberals can,t seem to do. Thanks for keeping up updated on this global hoax; which is pretty scary how long their absolutely biased one-sided argument has been foisted upon the public. Shows that the propagandaists can peddle any kind of tripe because bleedinghearts will mindlessly soak it up like a sponge.